Our master bath shower has a pan! Isn't it pretty? It's made out of cultured marble which is to say it's a man made product out of crushed marble powder and resin that is poured into a pan mold to the exact specifications of your space. We are using West Coast Marble & Granite, a company in Huntington Beach California, to make and install our pan. We met the terrific owners at a dinner party we threw last spring when Frank's mom's childhood friend (got all that) came to visit us with her husband. She told us about a relative of hers that she wanted to see; Ebbe and his wife Aimee from WCM&G. Ebbe is her cousin's son. Ah yes. All the relations... When they came to dinner, Ebbe and Aimee told us they had a marble and granite business. Imagine my ears perking right up. We went and visited them last July at their factory and it was really fun to see how they were pouring table tops, shower pans etc. We knew right then that we wanted to use them for the table tops for the vanity, tub and shower bench. Then, while I was researching shower pans, I was first looking into hot mopping and that is a big mess and not a very long lasting solution in my humble opinion. You might remember that during demo, we found that there had been a leak in the old hot mop pan in the shower. That is quite common, I learned. I was instead looking into fiberglass pans, which we used in our guest bath remodel with great success. The master shower is a bit larger so the price just shot up for the bigger size. $2500 one place I asked and $1200 the other place - although those prices were including a fiberglass bench. Ebbe from West Coast Marble & Granite said he could make me a pan for way less than that AND no tiling needed on top of that. It would be finished. And white. Honed white. Swoon. Three weeks ago Ebbe came out and made a template of the shower. Two weeks later: The new pan, last Monday, on the truck. Ready to come inside. So pretty! A VERY heavy process. Not at all as swift as those pictures would have you believe. Sounds were made. But it did make it up there and after some fiddling with the walls, the pan got in there! And what a beauty it is! 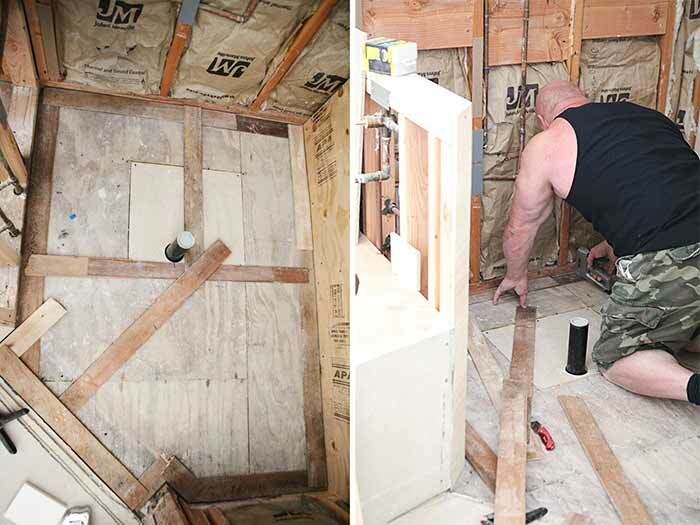 Before leaving, Ebbe measured for the table tops, and we decided to also go with all full slab white walls in the shower and around the tub, except for all of the back wall, which will still have the brown wood looking tile for contrast. Getting table tops made also meant that we had to scramble to find a sink so they could measure the cut-out correctly. Scramble, you say? but didn't you have the sink nailed down in the mood board? Ahh yes. Back in the day... When everything was on a mood board and everything was perfect. And we were going with the Odensvik sink from IKEA. That time? Then I went and bought two Odensvik sinks. Unwrapped them only to find out they weren't finished on the back. Arrhhgg. This type of sink is supposed to sit flush against the wall behind it. Just wait. That's going to become a theme when searching for a rectangle drop in sink in just a minute. The search began. And it was not a 3 minute search either. One of the last emails after a 1000 of "How about this one? ", clearly stated: "I am so tired of looking at sinks now". Here are the 9 of the top options. None of them actually fit all our criteria, so it's not like these are 9 equal choices. More like 9 compromises. But here they are. 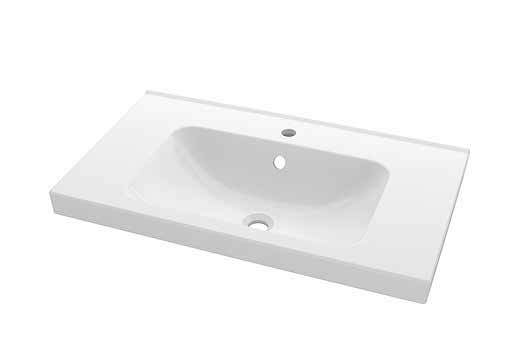 What I liked about each of them: They were a rectangle, white sink. 1: No hole for the faucet. Vessel sink faucets are twice the price of regular faucets and I am not loving the look of the faucet behind the tall sink edge. 2: The corners are rounded. I really wanted square corners. 3: We both did not like the front arch inside the sink. 4: Perfect, but also not finished on the back. We liked everything about this sink otherwise. We contemplated having it glazed on the back for a hot second, but it also has mounting holes, so pass. 5: Loved this one. And the price: $77. Perfect! but it has three holes instead of one for the faucet and doesn't come in a one hole option. I couldn't find a faucet I liked that fit with my design and the house. 6: Another great sink, but also not finished on the back. I think we have been over this. 7: It's a bit steep especially since we need two. 8: This had pretty much everything. It's still not finished on the back, but it is so deep that it doesn't matter. It would come out to be three inches away from the front of the table top where the other would be more than 6 inches away. It was a tad too modern and then the price. Next. 9: The one we originally wanted. Perfect price. Not finished on the back. The good news is that it is a large sink and in real life it is actually better looking than on the photos, probably because of the scale which you can't tell from the picture. So I am totally on board with this one. It was almost twice the money I wanted to spend though. Not a fan of that. But our bathroom needs sinks or it would look really weird, right? Our table tops are being made as we speak. I am excited about that. After the pan was installed last Monday, this weekend was spent cutting and installing Hardie Backerboard. A very dusty affair. We are a couple of strips of Hardie away from being done. I will share all that when the last Hardie screw is in. You almost need a mask and glasses just to look at that image. 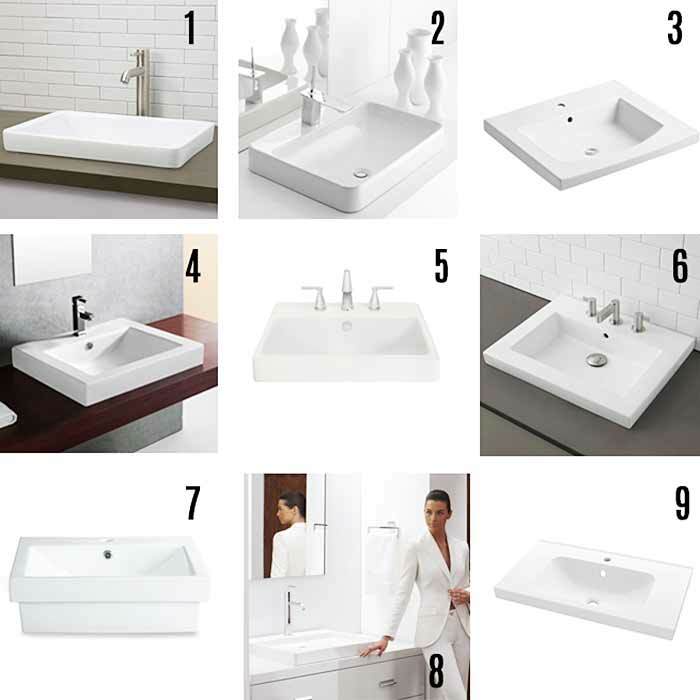 This article: Master bath pan installation and 9 rectangular sink options first appeared on http://ahomefordesign.com.